In 5 To Watch, five writers from The A.V. Club look at the latest streaming TV arrivals, each making the case for a favored episode. Alternately, they can offer up recommendations inspired by a theme. The reasons for their picks might differ, but they can all agree that each episode is a must-watch. In this installment: We share our picks for some of the most memorable small-screen vacations. Whether or not you plan to down some Hurricanes, spring break is upon us. For a certain demographic, it’s the time of year to leave your inhibitions at home. But here at The A.V. Club—where we only drink responsibly, if ever—we’re staying put and revisiting some of our favorite TV vacations. Some of these getaways are motivated by contractual obligations; others, an attempt to rekindle a spark. But they all provide truly enjoyable journeys, even when the destination is a shuttered World’s Fair. “Let He Who Is Without Sin” is frequently picked as one of the worst episodes of Deep Space Nine, if not all of Star Trek. In it, Worf and Jadzia Dax visit the pleasure planet Risa in order to work through some relationship issues; they’re joined by Dr. Bashir and the Dabo girl Leeta, who are there instead to commemorate a surprisingly forward-thinking “conscious uncoupling,” as well as Quark, who’s just there to get laid. In this effort he proves immediately successful. Risa is the hedonistic, everybody-fucks planet of the Star Trek universe, an endless paradise of beaches and leisure. (A purring, lamb-like Vanessa Williams guests as a native.) Much of the ire for the episode is directed toward the way it inverts all of this, with Worf turning weirdly conservative, and the plot focusing on an anti-pleasure terrorist cell that wants to undo Risa’s core principles. The reason why people travel in the first place is to expand horizons, gain perspective, and take a break from their humdrum, everyday existence. It certainly appears to do the trick at first for Don and Betty Draper in the season-three Mad Men episode “Souvenir.” Don gets a chance from his new pal/business prospect Conrad Hilton to visit Rome for a few days. Betty, worn down from a hot summer, annoying household errands, and a flirtation with governor aide Henry Francis, decides to join him. After arriving at the Rome Hilton in her pink suit, blond bob, and pearls, she almost immediately transforms into a dangerous European siren with a dramatic beehive and chic black sheath to match her dramatic eyeliner, unfurling flawless Italian and the sharpness to cut any number of Rome admirers to the quick. 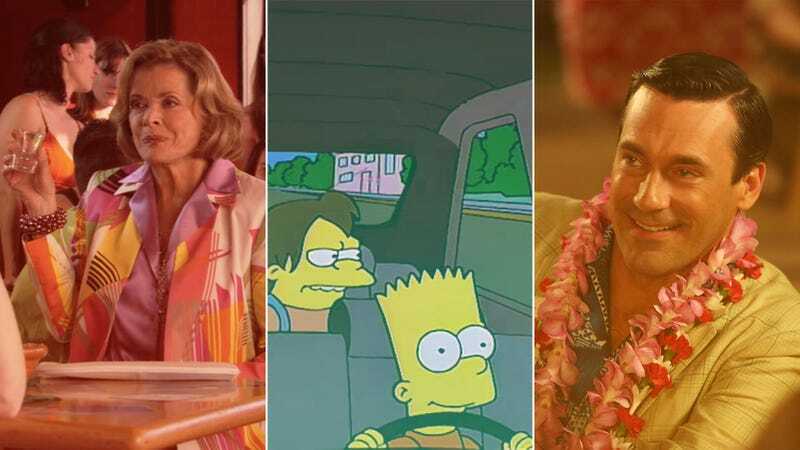 Bart’s penchant for mischief was established well before this ill-fated road trip in season seven, but “Bart On The Road” adds a new layer to the character, as well as his family and friends. Nelson, who’s later described as “an enigma wrapped in a puzzle, wrapped in a vest,” is revealed to have surprisingly mature tastes. (His toppling of the Wigsphere, though? Not so much.) Martin turns out to be a spendthrift who can’t wait a day to throw away his stock-market earnings at Wee World—hardly the kind of kid who should be class president. Even Principal Skinner shows uncharacteristic determination, announcing a “Take Your Kids To Work Day” just so he can go on spring break early.